Then the other disciple, who reached the tomb first, also went in, and he saw and believed; for as yet they did not understand the scripture, that he must rise from the dead. Then the disciples returned to their homes. But Mary stood weeping outside the tomb. As she wept, she bent over to look into the tomb; and she saw two angels in white, sitting where the body of Jesus had been lying, one at the head and the other at the feet. This is the day the church comes together to celebrate the GOOD news that is, quite frankly, unexpected, and a little hard to make sense of. We know all about death. That is the normal course of things in our life. It is resurrection that is unfamiliar. Even Jesus’ own followers, the people who walked, talked, and ate dinner with him, weren’t expecting it. Even though he had, not long before, brought Lazarus back from the dead. Mary wasn’t on her way to talk with Jesus in the garden. She was on her way to anoint his dead body. So we gather this morning to make sense of this remarkable and unplanned news. I confess that I am often drawn to Mary’s story in this text. It is easy for me to race past the story of Peter and the Beloved Disciple on my way to Mary’s encounter with the gardener. But this year, as I read this text, I remembered a painting I saw at a museum a few years ago. 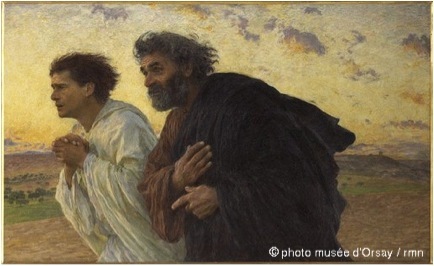 It was painted by Eugene Burnand and is a depiction of the footrace of Peter and John on their way to the tomb. The picture doesn’t quite do the painting justice, but I like the looks on their faces. Is it hope? Is it fear? Some combination of the two? Randy preached last week about Peter’s betrayal of Jesus, and you can understand the look on Peter’s face—both good and bad—what if Jesus comes back? What will he say to me? But maybe betrayal doesn’t have to be the final word—maybe I can apologize before he says anything! The other disciple, or “the one whom Jesus loved” is referred to as the Beloved Disciple by scholars and is commonly thought to be the persona of the author of the 4th gospel, John. If Peter is the disciple most like us—most likely to make mistakes, yet live his faith with great passion—the Beloved Disciple is the one who tends to respond correctly the first time. But look at what they do in this story. Mary has gone to the tomb to anoint a dead body. As far as she knows, Jesus is still dead and so she goes to care for his dead body. But she rushes back to where the other disciples are hiding and tells them that the stone has been rolled away and that someone must have taken his body. So our two friends here, Peter and John, race to the tomb. Now that I’ve had years of living in a home with boys, I no longer find it weird that they choose to have a footrace on the way to the tomb, because the three males who live in my house will turn any event into a competition, even a trip to the empty tomb. But I know there’s more to it than that. Perhaps they each have something to prove. Peter had, after all, just spent the last days running away from Jesus. And John—maybe he’s just showing us how ideal disciples behave—running head on into the mystery, willing to see for himself, whatever the news might be. What do you think he believed? The text doesn’t tell us. The text does go on to say, “for as yet they did not understand the scripture, that he must rise from the dead.” It is possible, perhaps even probable, that the Beloved Disciple believed without understanding. That may be where many of us are. We believe, but we still don’t understand what the Resurrection means in our lives. But our belief is enough to sustain us. Or maybe we are like Peter. Doing our very best after our very best wasn’t good enough, to make it up to Jesus. To be the best disciple we know how to be, even though we’re no model disciples. Peter is willing to have a relationship with Jesus at any and every cost. Maybe some days we are like Mary. After Peter and John have left to go back to their homes, apparently determined that there is nothing left for them to see at the Tomb, Mary stands at the entrance to the tomb. Weeping. Because insult to injury. Her teacher, her Lord, her friend is dead and now his body is missing. And this is not the way it was supposed to be. As if it wasn’t bad enough that they tortured and murdered him, now they’ve stolen his body! Before we move on to what happens next, remember that weeping can be an appropriate response to the Resurrection. Some days weeping is the best testimony we can offer. Because people we love are unjustly murdered by the powers of this world and then their bodies are stolen! On this day, 42 years ago, Martin Luther King, Jr was assassinated, reminding us that we weep over the violence in this world that tries to silence the prophets. Or some days we weep because loved ones get sick. Because justice does not rain down as it should. Because we lose our jobs. Because children in this world are hungry. Because wars wage across the face of the earth. And that is why Jesus calls Mary’s name; that is why God calls our names. Because he walked out of the tomb to bear witness to the fact that death does not have the final say. That God has unleashed a new creation with the Resurrection of Jesus. “Mary”, he calls out. She turns around, away from the empty tomb, away from her tears, away from discarded grave clothes, and toward the living Christ. But she can’t hang on to him in that moment. Because the story is still unfolding. There is work to do. She is instructed to proclaim the Resurrection to a hurting world, where people weep and suffer and worry. She is instructed to proclaim the good news of the resurrection and she does. We’re gathered here 2,000 years later because this woman told people when she saw God. It matters that you tell people when you have seen God, because all these years later, we’re still telling her story, even though in this text, at least, Mary’s best qualification for the job of evangelist seems to be that she recognized his voice when he called her name. Just as Mary couldn’t hang on to the resurrected Jesus in the garden, we can’t leave it there either. Because God’s new creation is still in process and there is a world out there that needs to hear a message of hope instead of the world’s message of fear and anxiety. We can’t just stop on Easter morning. We have Good News to share! The prophet Isaiah also gives us a glimpse of this new creation, this world God is bringing about. Isaiah was speaking to people who knew about exile, so he describes a world where you, and not some Assyrian invader, get to eat the crops you plant. A world where you get to live in the house you built. A world where children will not be born for calamity, but will live good and long lives—where a 100 year old person will be considered a teenager. Many of Isaiah’s images of this new creation are not crazy impossible ideals. He’s talking about health, and adequate food and shelter, and I think his images should instruct us as a church. How are we going to respond to the Resurrection in our community? I think that working in our community for those basic needs to be met—health, food, shelter—is a way to bring about the other, less normal, images in Isaiah. Where the lion becomes a vegetarian who eats straw and the lamb invites the wolf to join him for a movie. Isaiah makes it clear that things will change. But we’ve spent so many years where things don’t seem to change that I wonder if we can even imagine what would happen if everyone were able to live a long and healthy life? What would happen if everyone had adequate food and shelter? When that comes about, I suspect wolves and lambs hanging out together won’t seem so odd any more. New creation is not for sissies. 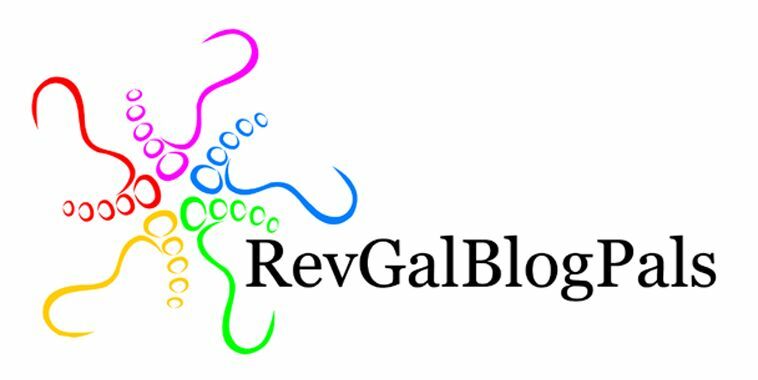 New creation and resurrection faith call us to work for a better world, here and now, for all of God’s creation. “I have seen the Lord!”, we proclaim to a world with our very lives, seeking to make God’s new creation visible in a world that tells us it will never be so. The witness of the empty tomb reminds us that this world doesn’t have all of the answers though. So we proclaim, “I have seen the Lord!”, even though the world thinks he is dead and gone. Friends. Before we even called, God has answered. Thanks be to God. Amen.